This design is from a transfer I picked up in a hurry a few years ago so as to have something to stitch while on holiday. It went swimmingly for a while and then ran into a brick wall and I have only just finished it. The threads are wool and cotton, with a little bit of rayon. I intended the panel as a companion for my Jacobean Firescreen, so the colours of teal, brown and gold more or less chose themselves. There aren’t as many overdyed threads as I sometimes use, but that allows me to experiment all the more with the stitches. Since I picked it up again, I’ve used it to play with some of the stitches which are new to me that I found in my copy of Yvette Stanton‘s Right Handed Embroiderer’s Companion. The whole thing became much more fun at that point! 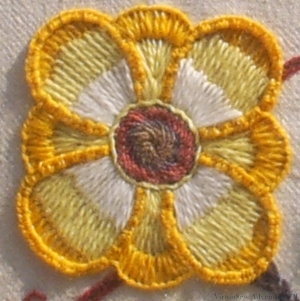 So here, for example, the centre of the flower is worked in Spiral Trellis Stitch. I used a single strand, round thread overdyed in rust brown and purple, and although it was hair-raising to stitch, because I felt I was twisting myself in a spiral at the same time, I think it is rather successful. It’s not perfect, but I’ll do better another time, and I do think it looks rather good! The dark brown rather lacy stem is worked in Mountmellick thorn stitch – another new one. Here I used one strand of a three-stranded cotton yarn. I think it would look better in a slightly heavier yarn, but it was fun to do and I will use this stitch again. 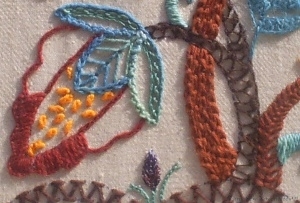 The calyx of the strange fruit shows two of my favourite stitches – Cable Chain and Portuguese Knotted Stem. I’m not entirely content with either of the flowers, but as I’m not sure why I shall leave well alone. Both of them have been unpicked at least twice, and I don’t want to wear out the fabric… Still, now it’s finished, I enjoyed working this! A view from my bookshelf. . . I really like this. It’s so confident and cheerfull. And wha’d’you know? You can do enjoying it! Wow – so cheerful and bright! Truly a luscious garden. wonderful! when are we going to see your big piece? the one from last time. It’s lovely, Rachel. And as for ‘a few years’ – Pah! I take your ‘few years’ and I treble them! I love Jacobean work, and although you haven’t shown a close-up I think my favourite flower is bottom right. Thankyou for your comments Rachel. I’ve always loved experimenting with new stitches and had a tendency to get addicted to any new ones I tried! You’ve done well with the panel ………….. it’s difficult stitching heavier threads on a more tightly woven fabric! Re the flowers, I think they are great. I would say, if I HAD to – that there is a bit too much bright yellow at the top of the design (mostly in the top flower) so it tends to point the eye up to it …. but that totally is my 1 cents worth. The other flower looks a tiny bit dull next to it in terms of colouring. And I have a thing about yellow anyway, I must admit. My parents gave me a 70’s entirely yellow bedroom. Carpet, curtains, bedspread, everything. I have had a problem with yellow ever since then! Tho I’m getting better with it over the years….even used it! Rachel, its lovely. I think your spiral trellis looks great. Its a stitch that I love, and is very eyecatching. 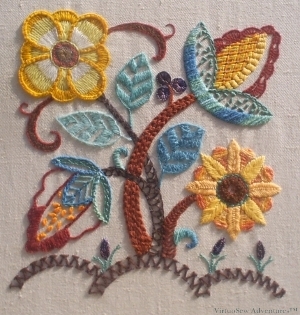 I find that students always ask “What’s that one?”, pointing to spiral trellis on embroidery. Glad that you’re getting good use out of the book! Lovely work and a great pattern.